In 2017, it is estimated that 18.8 million people were newly displaced as a result of disasters linked to natural hazards, a majority of which were weather and climate related. This number is likely much higher when accounting for people compelled to move from their place of origin in the context of slow-onset events and processes linked to the adverse effects of climate change and environmental degradation. Large-scale movements of people, with climate change as one of the drivers, affect regions across the world, particularly countries and communities most vulnerable to climate change, including Small Island Developing States and Least Developed Countries. The acknowledgement of the link between climate change and such movements is nothing new, in 1990, the first Intergovernmental Panel on Climate Change (IPCC) report warned policymakers that “the gravest effects of climate change may be those on human migration as millions are displaced by shoreline erosion, coastal flooding and severe drought”. Looking towards the future, the World Bank projects that in three regions (Sub-Saharan Africa, South Asia and Latin America), without additional and concrete climate and development action by 2050, more than 143 million people could be forced to move within their own countries to escape the slow-onset impacts of climate change. Responding to the challenges of human mobility and situations when people are compelled to move from their place of origin in the context of the adverse impacts of climate change and disaster as one of many drivers, is a critical challenge of our times across all regions. The issue represents development, humanitarian and human rights challenges and will increasingly require investments in understanding and identifying risks, reducing vulnerability and exposure and addressing impacts and protection needs. Moreover, efforts to address the drivers that compel people to leave their place of origin and measures to manage an ensure safe, orderly and regular human mobility when movement of people is unavoidable, require international cooperation and integrated whole-of-government approaches with the participation of all relevant stakeholders. The adoption of the Paris Agreement under the UNFCCC on 12 December 2015 at COP21 represents a milestone in the international response to the challenges of human mobility in the context of the adverse effects of climate change. 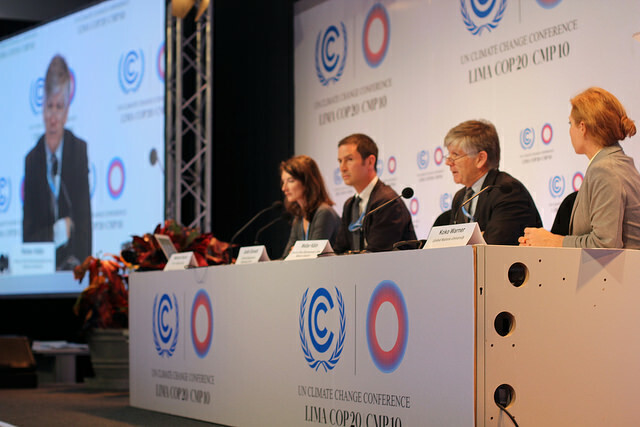 COP21 also requested the Executive Committee of the Warsaw International Mechanism for Loss and Damage associated with Climate Change Impacts (the Executive Committee) to establish a Task Force on Displacement to develop recommendations for integrated approaches to avert, minimize and address displacement related to the adverse impacts of climate change. The Task Force has now delivered on this mandate, and the recommendations on integrated approaches have been forwarded by the Executive Committee for consideration by Parties in Katowice, Poland, on 3-14 December 2018. These recommendations provide a range of actions and policy instruments that aim to strengthen policies, institutional frameworks, tools and guidelines, and the preparedness and capacities of national and local governments to address climate-related drivers and the impacts of displacement. The recommendations also recognize and stress the importance to enhance knowledge, data collection and monitoring of risks, and coordination and policy coherence. The recommendations outline what actually can or should be done to avert, minimize and address displacement related to the adverse effects of climate change and disasters, and they identify a range of relevant stakeholders, under as well as outside of the UNFCCC. The recommendations represent the culmination of the work undertaken by the Task Force since its establishment, and their implementation will help Parties, stakeholders and affected communities better understand displacement, address risks and be better prepared to respond to displacement in the context of climate change and disasters. They will also lead to better preparedness and increased capacity to address challenges in a future where more people will likely be forced to move in the context of the adverse effects of climate change. Implementation will require commitment, engagement and collaboration from a wide range of stakeholders including Parties, relevant bodies under the UNFCCC, United Nations Agencies and other stakeholders to work together and take the recommendations forward in an integrated and coordinated manner. 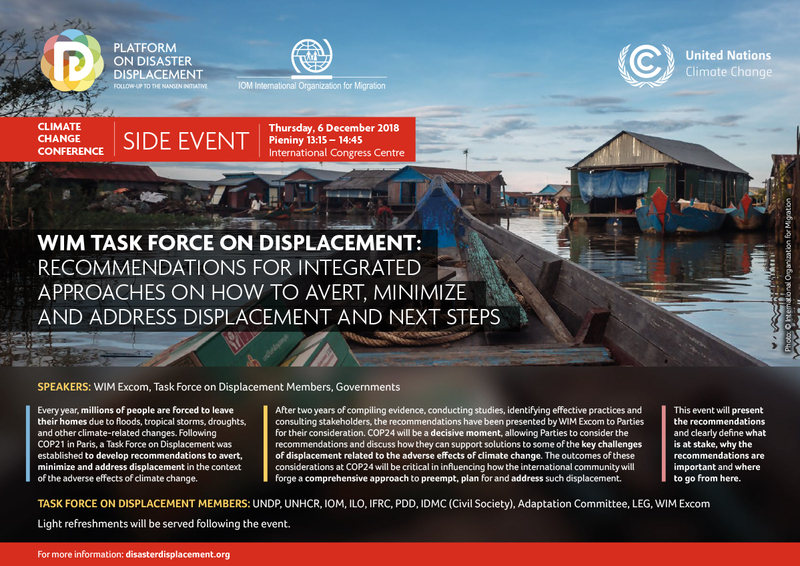 Thus, the objective of the side event is to highlight the significance of the recommendations that have been submitted by the Executive Committee to the Parties for consideration, including how these recommendations can lead to solutions to some of the key challenges of displacement related to the adverse effects of climate change. In doing so, the side event aims to clarify what is at stake, generate support for the recommendations leading to their adoption by the Parties, and stimulate a discussion on what needs to be done for enhanced implementation at the sub-national, national, regional and international level. Situate and link the work of the UNFCCC’s work on displacement related to the adverse effects of climate change to other relevant global policy processes and promote dialogue, coordination, coherence and synergies between them. IPCC. 1990. Policymakers’ summary of the potential impacts of climate change. Report from Working Group II to IPCC, Intergovernmental Panel on Climate Change, Commonwealth of Australia, p. 20. World Bank. 2018. Groundswell. Preparing for Internal Climate Migration. World Bank, Washington, DC.